Geoffrey was born and resided in the Hamilton area for the first 18 years of his life. Geoffrey is now 54 years old and resides in Oakville, with Christina; his lovely wife of 23 years. Although he lives in Oakville, Geoffrey is a member of Central Presbyterian Church in Hamilton. Geoffrey is self-employed as an Employee Benefits Consultant, and has been so for the past 25 years. Geoffrey was initiated into The Electric Lodge #495 in 1988 and recently celebrated 25 years a mason this past March. He is also an affiliated member of Valley Lodge #100 and Superior Lodge #672 in the Algoma District. Geoffrey has served The Electric Lodge as Worshipful Master in 1997, 2004, and consecutive years of 2009 and 2010, during their 100th Anniversary. Geoff’s leisure activities extend to photography, motorcycles, downhill skiing, woodworking and theatre. He has a sincere passion and love for the Theatre and has worked with numerous Theatre Groups as an Actor, Stage Manager, Lighting Designer and Producer. He is grateful for the acting and theatre experience as he feels it brings a unique perspective to the understanding, delivery and presentation of our Masonic ritual. At the request of R.W.Bro. Peter C. Mouriopoulos, DDGM in 1998, Geoffrey became involved in the affairs of Hamilton C District by pioneering and designing our first District website. He went on to serve as the Hamilton C District Webmaster for the next 10 years. The development of the website from its humble beginnings to its present form has become an extremely valuable communication tool for all brethren. He was also responsible for designing and implementing the first website for the Grand Chapter of Royal Arch Masons of Canada in the Province of Ontario. Geoffrey is a member of St. John’s Chapter RAM #6, where he served as First Principal for two consecutive years from 2001 to 2003. 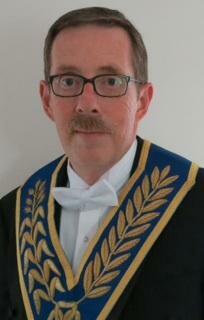 He currently serves St. John’s Chapter as Scribe E (Secretary) and has done so since 2009. This past April, he was appointed as a Grand Steward of the Grand Chapter of Royal Arch Masons of Canada in the Province of Ontario for serving as the District Secretary to R.Ex.Comp. George B. Fairbairn. Geoffrey is also a member of the Royal and Select Masters as a Super Excellent Master in Adoniram Council #2. As a credit to his Scottish heritage, Geoffrey has been involved with The Electric Lodge’s ‘Robbie Burns Night’ every January, since its inception 15 years ago. Over the years, this event has been used as a Fundraiser for the Lodge in which over $43,000.00 has been donated to the Women’s Shelter, Martha House. Geoffrey has presented the “Address to a Haggis” each and every year. Geoffrey is very much looking forward to working with the brethren of Hamilton District C on behalf of our Grand Master, M.W.Bro. Donald A. Campbell.